I will only read and watch things that are pleasing to Heavenly Father (My Gospel Standards). Every day you have choices. Listen to the Holy Ghost. 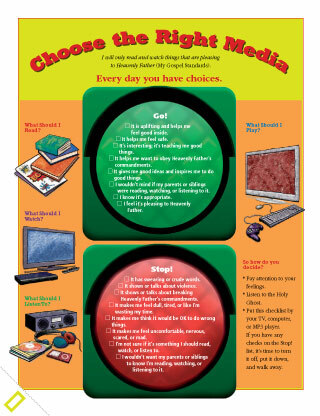 Put this checklist by your TV, computer, or MP3 player. If you have any checks on the Stop! list, it’s time to turn it off, put it down, and walk away. I wouldn’t want my parents or siblings to know I’m reading, watching, or listening to it. One day, I was playing a good, fun game on the Internet. Then I noticed that the website I was on was advertising games with blood and gore. I had an uncomfortable feeling, so I exited the website. Later I found the same game on a different website that did not advertise bad games. I felt way better after I turned off the website advertising bad games. I am glad I have the gift of the Holy Ghost so I can be protected and comforted. I am glad the Holy Ghost helps me make good choices. Say a prayer asking Heavenly Father to forgive you if you did it on purpose, and help you feel better. Tell a parent about what happened and ask for help. Listen to, play, or sing a favorite Primary song. Read a story from the Friend or from the scriptures. Change the scene﻿—go play outside or do something helpful for a friend or family member. Listen to or watch scripture stories at scripturestories.lds.org. Watch videos and listen to music at lds.org/friend and lds.org/youth. And, of course, read the Friend!